Product information "Z-Wave.Me Serial Adapter Module for Z-Wave"
The ZME_SERIAL is a little daughter board that connects a serial interface to the wireless Z-Wave network. The interface to the host is done by a 5x1 jumper connector that can be used in normal position and upside down. The pinout is 3.3V, TXD, RXD, GND, NC. The connection to the antenna is done using a reverse pigtail connector. The module itself contains a Z-Wave 300 chip preloaded with the Z-Wave.Me Z-Wave firmware and a 32 K EEPROM. There is an additional 2x5 pin programming connector compatible to the 2x5 connection of the Sigma Designs Programer. The firmware implements a superset of the Sigma Designs Serial Interface, including some Z-Wave.Me specific functions such as backup and restore or change of vendor ID. 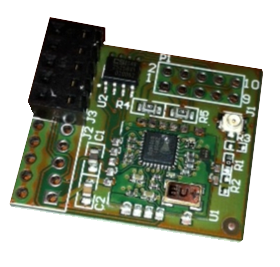 Related links to "Z-Wave.Me Serial Adapter Module for Z-Wave"